Why is health care on the spotlight in the race for the US 2012 presidential elections? As the United States (US) presidential elections of 2012 approaches, the health care debate has been brought to the spotlight again. Among others, the discussion is concerned with universal coverage, expenditure management, insurance reform and the fundamentals behind provision and funding. But why is the reform of the US health care system so important to be on the centre of the presidential election’s debate? Firstly, it is of uttermost important to describe one main characteristic of the US health system. In this country, although health care provision is not a synonym of health care insurance – the population has the right to a minimum level of treatment in a life endangered situation regardless of their ability to pay – the fact is that most of health care provision requires patients to have private or public health insurance. However, many Americans do not qualify for public health insurance coverage and either cannot afford, choose not to purchase or do not qualify for private health insurance. As a whole, US Census Bureau reported that 16,3% of Americans (49,9 millions) were uninsured in 2010, which shows the fragility and inequity of such a health care system. Secondly, there is the question of excessive spending on health care. 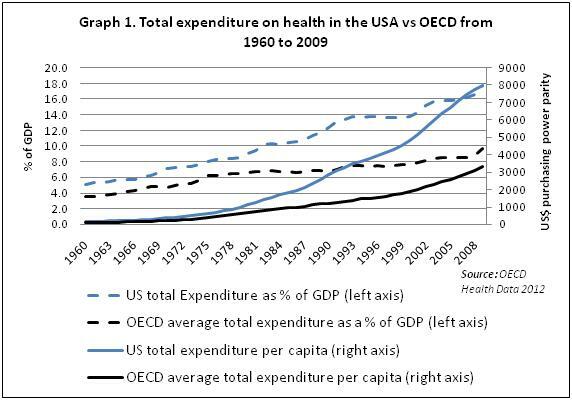 As graph 1 shows, health care expenditures as a percentage of GDP in the US have been growing fast from 1960 to 2009 passing from 5,1% to 17,7%, always above the OECD average and representing the highest share among OECD countries. The USA was also above the average of OECD in health spending per capita (in US$ purchasing power parity) from 1960 to 2009. 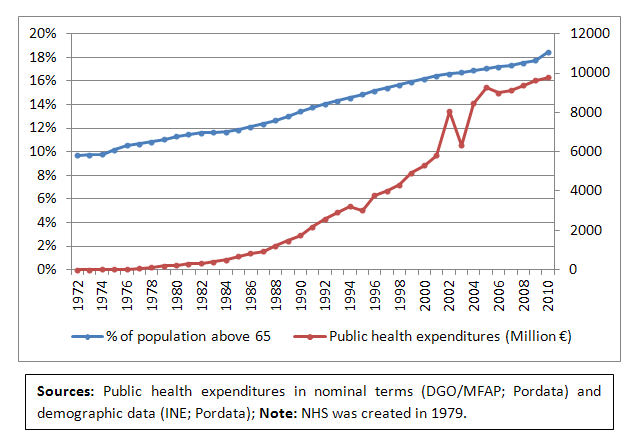 As shown, health spending per capita in the US has grown promptly in this period, from 148 US$ to 7990 US$. These values, quite impressive by themselves, lead researchers to claim that the US is not efficient in the application of its health care resources. For instance, a study by the Institute of Medicine of September 2012 claimed that as of 2009, 750 US$ billion spent on the US health care system were wasted mainly on unnecessary services and that they could have provided instead health insurance coverage for 150 million workers. Taking this into account, it is understandable why during its mandate Barack Obama has insisted on a health care reform approved on March 2010, the Patient Protection and Affordable Health Care Act (PPACA). This includes a number of health-related provisions for the next four years aimed at providing affordable health insurance to all US citizens. In the 2012 elections, Obama is campaigning against his rival Mitt Romney by strongly defending the PPACA reforms and this has proven to be so successful that Romney has already publicly supported some of PPACA’ measures, when before he stood against them. Who will win 2012 presidential elections in the US? Nobody knows. Nevertheless, the health care discussion will certainly continue in the US. Categories: Economics, Health Economics, Health expenditures | Tags: health economics, health expenditures growth, US health system, US presidential elections | Permalink.